Before the dessert, I was offered cheese from the a la carte menu too but I declined. No way I could fit all these in! So I just went for the the Grand Dessert which is another trio. Out of the three items, the yuzu mousse cake was the one that I was looking forward to the most. Whenever I see yuzu, it reminds me of the JAL Sky Time Yuzu, which is the Sky Time flavor that I fell in love with. So I was expecting the same kind of sourness with this mousse cake. But instead, it was a very light and not sour at all. It was not bad but just not what I was expecting. However, I did like the real yuzu flesh which added a different texture to the cake. The vanilla ice cream wasn't too special. Just some rich premium ice cream one would expect in First Class. But the Arc of The Sun JAL logo on the container did bring back some good old memories and put a smile on my face. Although the raspberry sauce was meant for the mille-feuille, you could definitely add that to make your own ice cream sundae. There were fresh fruits from the a la carte menu which includes strawberry too. But I only ate the ice cream as is because I wasn't too into raspberry (or any berries :P). The star of the dish was the mille-feuille. The puff pastry was simply divine. I could simply eat the pastry itself all day long without any custard or sauce! The pastry had the right amount of crunch and exploded into buttery flakes inside your mouth. The pastry to custard ratio was well balanced so it wasn't too heavy or overly sweet. Another thing I liked was that raspberry sauce was provided instead of putting a layer of icing or dusted it with icing sugar. This way people could adjust the level of sweetness themselves. After dessert, beverages were offered. I am not a coffee lover and would usually go for a nice cup of hot tea after the first meal. 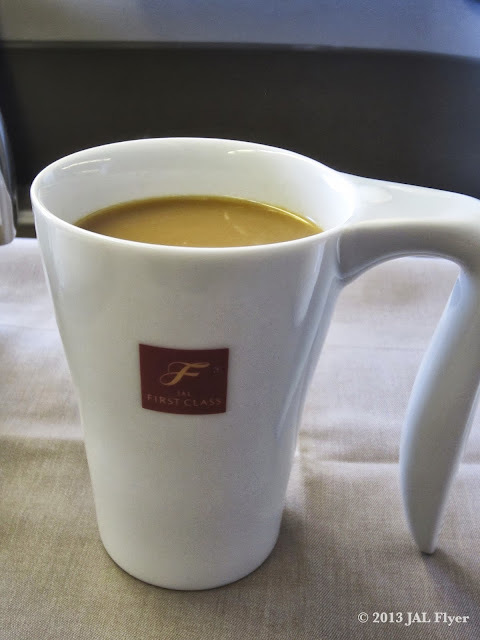 But I went for the coffee instead this time because of two reasons: the JAL First Class coffee mug and JAL CAFÉ LINES! In case you don't know, JAL has this unique porcelain mugs from Hasami, Nagasaki exclusively designed and made for JAL. What so special about this mug? Here's the description from the menu. The shape of the mug was inspired by a traditional Japanese pail called a "teoke". Universal Design has been incorporated to make it easier to grip and use. The mug also has a lead-free glaze. These unique and eco-friendly porcelain mugs have been exclusively designed by Hasami Nagasaki for Japan Airlines. Every since JAL rolled out the JAL CAFÉ LINES on September 1 2011, I have been dying to try out the coffee offered in First Class. 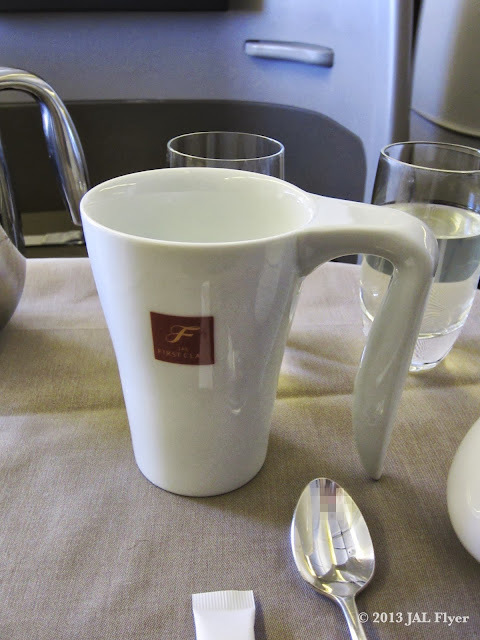 I have tried the ones offered in all classes on domestic and international flights except for the international First Class ones. The JAL coffee was delivered in a Bodum French Press to bring out the inherent goodness of the beans. Sometimes, the cabin attendant would provide a 3-minute hourglass and inform you that you should wait for 3 minutes before pressing the plunger. But not today. The attentive cabin attendant has already waited for 3 minutes before delivering my coffee so I don't have to go through the "trouble" to wait for 3 minutes LOL I still got to use the French press myself though. Since I am no coffee expert, I would once again borrow the description from the menu. This Grand Cru coffee features the 2010 Bourbon varietal crop from the renowned San Sebastian Farm located in Antigua Guatemala, extravagantly blended with a rare 2011 Kenya varietal (Arabica) grown at Selva Negra Farm in El Salvador, offering a perfect taste for the summer season. A fresh sweet acidity with ripe raspberry after notes and a silky and velvety finish. Please savor "Summer Blend's" fruity acidity and it's lingering sweet nutty aftertaste.